Two Turkish cartoonists have received jail sentences after being convicted of insulting President Recep Tayyip Erdoğan. They were sentenced yesterday to fourteen months in prison, though the punishment was then reduced to eleven months and finally commuted to a 7,000 lira fine. 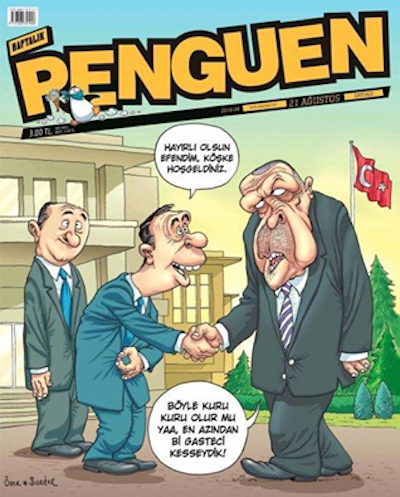 The cartoon in question, by Bahadir Baruter and Ozer Aydogan, appeared on the cover of the satirical magazine Penguen on 21st August last year. It depicts Erdoğan meeting a civil servant, who is buttoning his jacket with one hand while greeting the President. A reader complained to the government that the civil servant's hand gesture was an insult implying that Erdoğan was gay. Penguen previously faced prosecution in 2011, when it published a cartoon containing the words "There is no Allah". In 2005, it was sued by Erdoğan (who was then Prime Minister) after it depicted him as a variety of animals. Earlier that year, newspaper cartoonist Musa Kart was fined for depicting Erdogan as a cat. Erdoğan sued Kart again last year in relation to another cartoon. In 2006, Erdoğan sued artist Michael Dickinson, who had depicted him as a dog in the collages Good Boy and Best In Show.